Secondary bone cancer is a group of diseases, which arise in different tissues of the body, but end with cancerous transformation of bone tissue. Contrary to popular belief, secondary bone cancers are more common than primary bone cancers. Although it does reflect the less susceptibility of the bone tissue to cancerous transformation, such that only advanced cancers in other parts of the body are able to penetrate it. It is rather due to the staggeringly large numbers of people affected with cancers, like breast cancer, lung cancer, prostate cancer, and so on, which later on lead to secondary bone cancer. Hence, even if only a small percentage of cancers spread to bones, the numbers are still quite high. The spread of cancer from one part of the body to another is known as metastasis. This is a common occurrence in a cancer that has become malignant (worse). The common organs to which a malignant cancer can metastasize are brain, bone, lungs, liver, and lymph nodes. Since the origin of the cancer lies in another organ (primary site), these new cancers are called secondary cancers. Some malignant cancers are known to have affinity to secondarily involve a particular tissue. This is highly related to the anatomy and physiology of the organ in which the primary cancer is located. However, exceptions and surprises are not uncommon for the process of cancer, especially one that is malignant ! Direct spread occurs to parts which are close to the primary cancer, like Ca. Ovary spreads to liver. 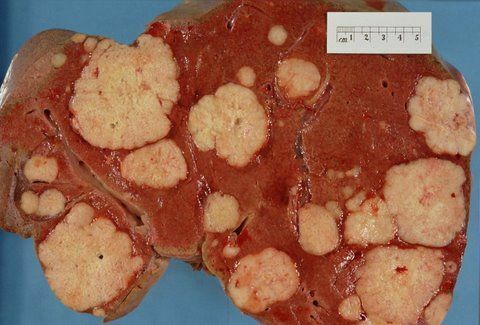 Lymphatic spread, which occurs initially to the lymph nodes draining the area of primary cancer, and later to higher lymph nodes and other lymphatic organs, like majority of carcinomas. Hematogenous spread occurs when blood acts as a vehicle for transport of cancerous cells, like majority of sarcomas. Spread of a cancer to bone tissue commonly occurs by hematogenous spread due to the abundant supply of blood to the bone marrow. This is more so for the vertebral bones, since their bone marrow retains the blood producing cells throughout life. This is also the reason why secondary bone cancers are more commonly seen in vertebral bones ! Prostate Cancer is a common disease in elderly men. Prostate is a specialized organ of the male reproductive system, which is located just below the urinary bladder (Picture 2). Though, the effects of a prostate cancer are highly localized, like difficulty in urination, pain, and so on, it can spread to different parts of the body by the process of metastasis, causing back pain, pneumonia, etc. However, it is commonly seen that cancer cells from the prostate frequently reach the vertebrae in the lower back.This is because of the absence of valves in the veins between the vertebral column and the Batson’s plexus, which surrounds the prostate. Thus, blood flow, which is normally from the vertebrae to the prostate, is also possible in the reverse direction, carrying cancerous cells from prostate to the vertebrae. An isolated prostate cancer can be easily treated by removal of the prostate. But infiltration to the vertebral column, leads to a complex problem with bizarre symptoms, like back pain, vertebral fractures, spinal cord compression, and so on. These can result in paraplegia (loss of control over the lower limbs, i.e. paralysis), loss of bowel and bladder control, etc. Hence, it is very important to detect and surgically remove the prostate in prostate cancer, to prevent such complications of advanced disease. Breast cancer is the commonest form of cancers in the world. Surprisingly and contrary to popular belief, even males can be affected by this disease ! Though certain individuals are genetically predisposed to suffer from breast cancer, alcohol, hormones, and dietary fat intake, also play an important role. Metastatic spread of breast cancer commonly occurs to bones of the spine, ribs, or pelvis. This is associated with bone pains as well as fractures caused by trivial falls or trauma (also called pathological fracture). Bony metastasis in breast cancers need early detection and treatment to prevent pathological fractures from occurring. This is generally done by routine X-ray or MRI examination of the spine and pelvis. If there is evidence of breast cancer spread to the bones, a surgical stabilization of the bones by use of metal screws and plates is essential at the earliest. This not only prevents fractures, but also controls bone pains. This can be followed by treatment with bisphosphonates, which prevent osteoporosis caused by osteoclasts (activated by proteins produced by cancerous cells). Lung cancer is related to smoking and occupational exposure to asbestos, silica, etc. The role of certain genes in causing lung cancer has also been documented, by their incidence is greatly outnumbered by the former etiology. Despite several studies clearly documenting the association, smoking remains predominant because of its addictive potential and flair. Lung cancer symptoms are not obvious or trivial, like persistent cough, occasional blood in cough, shortness of breath, and so on. These are generally present in chronic smokers, irrespective of the presence or absence of cancer. Hence, many times the bony metastasis leading to a fracture or bone pains are the first clue towards the diagnosis of lung cancer. Secondary bone cancer from lungs can affect spine, ribs, and pelvis. 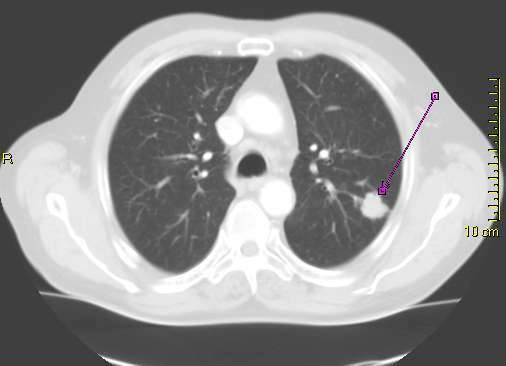 Metastasis to the small bones of hand and feet is a unique feature of lung cancer. This is possible because blood flows from lung to the heart and from there is carried to different parts of the body. Thus, lung cancer is one of the commonest cancers to metastasize to the fingers or toes. Since, lung cancer is diagnosed mostly during its advanced stage (after it has spread to bones and other body parts), prognosis is worse and chances of survival are quite meager. Palliative measures like stabilization of vertebral bones and resection of the lung tumor followed by radiotherapy and chemotherapy. Thus, periodic screening with chest x-ray or CT scan (Picture 3) can facilitate early detection and better outcome in lung cancer patients.